It seems every Christmas I come across some argument raging on social media about Die Hard. "It's not a Christmas movie." "It is, but the people who say it's their favorite are just trying to seem cool." "Who cares, just let people watch Die Hard, it's a great movie!" My thinking tends to go toward that last one. I've got plenty of movies many people probably don't count as Christmas Movies that I like to watch at Christmas time every year. Gremlins. Kiss Kiss Bang Bang (pretty much every Shane Black movie would be in this category). And Die Hard. Look, if it's a movie set at Christmas time, and people like having the excuse to watch it every year, let them. Let people enjoy things. Don't be a Scrooge. To that end, this year I wanted to celebrate Die Hard in all of its Christmas-y glory. 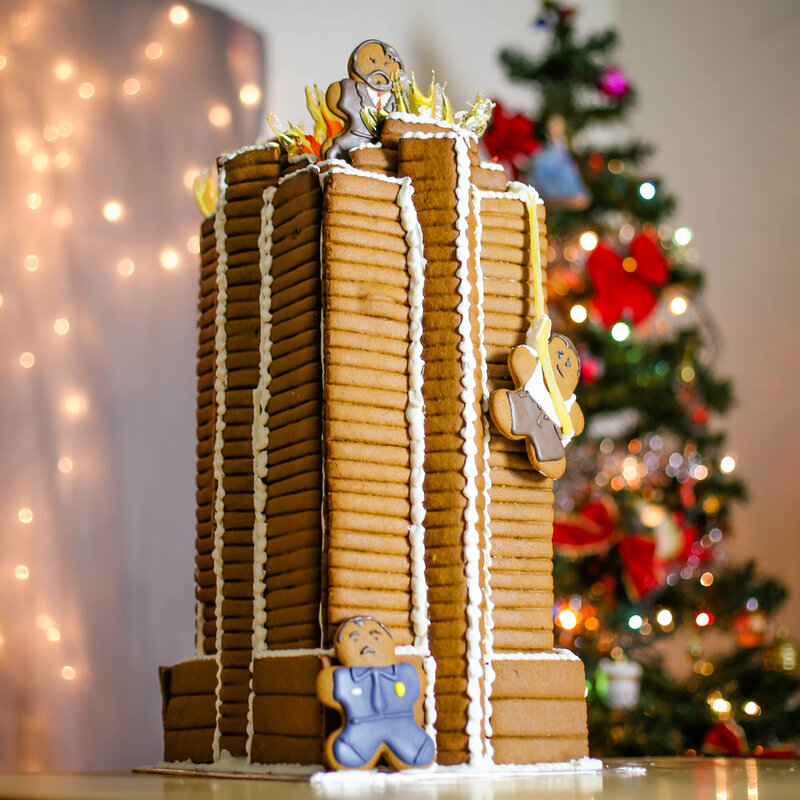 I've wanted to make a gingerbread version of the Nakatomi Plaza for a few years, but it was a daunting undertaking. I split the project into several days, and I decided to record it, partially because I thought it would be cool to show you all when it was done, and partially to keep myself motivated to complete it. 1. Shop for redundancies. I ended up going back to the store twice because I severely underestimated how much gingerbread dough I would need to complete my task. Have enough supplies on hand and then some, because you never know when that extra jar of molasses ends up being your "thank God I have this" jar of molasses. 2. Decorate before you bake. I had originally considered drawing the window lines into the building with icing, and the thought of piping on such straight lines over and over and over was already giving my a headache. Plus, with my clumsiness I was certain to stick my elbow in something before it was dry and end up with a mess. I ended up, instead, pressing lines into the dough before baking, and I think it made a pretty neat effect. I had planned to use a wooden dowel to make press in the lines, but I had some leftover photo-booth signs from our annual Christmas party that were held on nice thin sticks. 3. Trim after baking. Obviously, rolling out on parchment helps keep everything from getting too warped before you bake, but when making such large pieces, it's normal for the dough to come out of the oven a little differently-sized than it went in. You can trim the excess with a knife when it first comes out of the oven and is a little soft. Or, if you've let your pieces cool and harden, you can take a small cheese grater to the edges to shave them down. 4. Have fun! I know this seems obvious and silly, but don't get too bogged down with making the prettiest, pinterest-worthiest gingerbread house. I was so concerned about how best to decorate this one, and in the end I just decided to leave the building mostly plain, because I was gonna blow up the roof! And John McClane was gonna be hanging by a sour straw fire hose! And Hans would be on top for some reason! Also I obviously had to include Al because his relationship with John is the heart of the movie. Anyway, the point is, make sure you're excited about what you're doing, because it's a time consuming job and you've got to be motivated.